It includes the hydrolysis products of simple and compound lipids and also various other compounds such as steroids, terpenes, fatty acids, alcohols, fatty aldehydes, ketones etc. Since they contain no fatty acids, they are non-saponifiable, i.e., cannot be hydrolyzed by heating with alkali to yield soaps of their fatty acid components. The steroids may be separated from the fat after the latter is saponified since they occur in ‘nonsaponifiable residue’. All steroids may be considered as derivatives of a fused and fully saturated ring system called cyclopentanoperhydrophenanthrene or sterane. This system consists of 3 cyclohexane rings (A, B and C) fused in nonlinear or phenanthrene manner and a terminal cyclopentane ring (D). 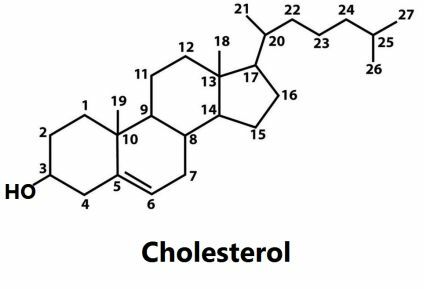 Cholesterol has a molecular formula, C27H45OH. In addition to an OH group at C3, there is a double bond at C5. The hydroxyl group constitutes its polar head, the rest of the molecule is hydrophobic. It is a white crystalline solid and is optically active, [α]D 39°. The crystals are rhombic plates with one of the angles broken. It has a melting point of 149°C. Cholesterol is generally believed to be notorious as a major cause of heart disease. There are 2 types of cholesterol, the lowdensity lipoprotein cholesterol (LDL-C) and the high-density lipoprotein cholesterol (HDL-C). It is the principal sterol of higher animals and is especially abundant in nerve tissues and in gallstones. It occurs either free or as fatty esters in all animal cells. It was first isolated in 1784, from human gallstones which consist almost entirely of cholesterol and hence so named (cholesterol literally means ‘solid alcohol from bile’). Its main sources are fish liver oils and the brain and spinal cord of cattle. Cholesterol is , however, not found in plant fats. It occurs in feces and is produced in the intestine as a result of bacterial action on the double bond of cholesterol. The A/B junction is -cis in coprostanol in contrast to -trans in cholesterol. It is present in ergot (hence its nomenclature), yeast and the mould Neurospora. Its parent hydrocarbon is ergostane, C28H50. Ergosterol has a molecular formula, C28H43OH with one OH group at C3 and 3 double bonds at C5, C7 and C22. It is also optically active, [α]D -135°. It is a major constituent of wool fat and is also present in minor quantities in liver and yeast. Lanosterol is a C 30 compound with twin methyl groups at C 4 and a third angular methyl group on C 14. There are 2 double bonds at C8 and C24. It is an intermediate in the biosynthesis of cholesterol. Among the non-saponifiable lipids found in plants are many hydrocarbons known as terpenes (from turpentine). In general, these hydrocarbons and their oxygenated derivatives have lesser than 40 carbon atoms. 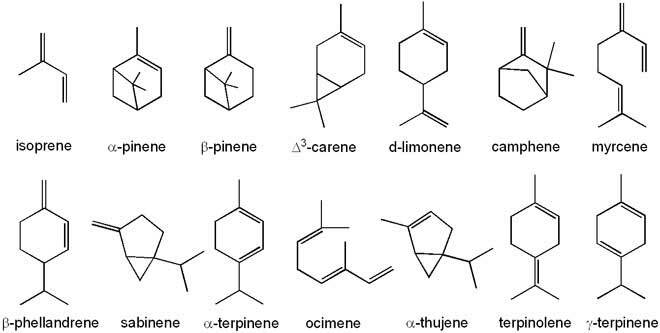 The simplest terpenes are called monoterpenes and conform to the formula C10H16 (equivalent to 2 isoprene units), those with the formula C15H24 are called as sesquiterpenes, with C20H32 as diterpenes and with C30H48 as triterpenes. 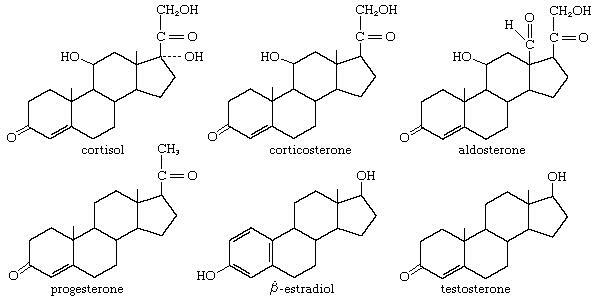 Terpenes with 40 carbon atoms (or tetraterpenes) include compounds called carotenoids. The presence of long hydrocarbon chain in carotenoids makes them lipid-soluble; they are hence also called lipochromes or chromolipids.